I woke up this morning knowing that I was in no hurry to get ready for work at 8am. On occasional Wednesdays my schedule is 12-3pm, and today was one of those lucky days. Since I technically have no where to be until noon I decided to take my time with making breakfast this morning. 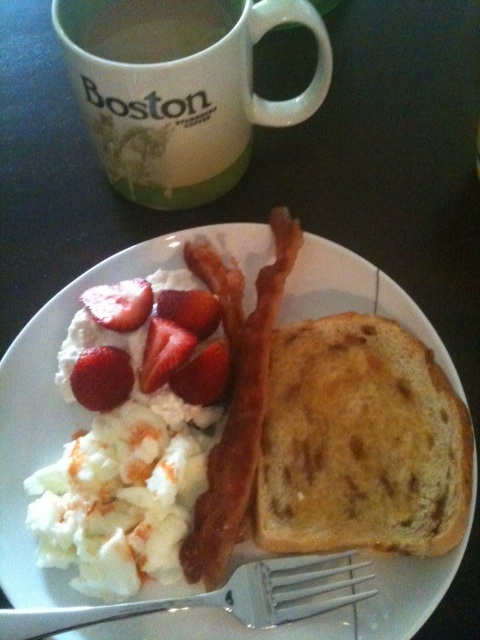 I made some egg whites and bacon and served it alongside cottage cheese with chopped strawberries and a slice of cinnamon chip bread from Great Harvest Bread Co. The bread, although delicious by itself, tasted great with a smear of honey apple butter. Now to finish my much needed cup of coffee ... check out my souvenir from our Boston trip in the background.